The question I get asked most by people who are just beginning to follow an oil-free diet is “If you don’t use oil, what do you put on your salad?” Frankly, getting used to salads without olive oil can be difficult, though I do believe you can train your taste buds to enjoy salads without oil if you add enough flavor to them. It’s not enough just to remove the oil from any old salad dressing; you have to replace it with a liquid that will dilute the power of the vinegar in the dressing, add some body so that the dressing isn’t watery, and add flavor. 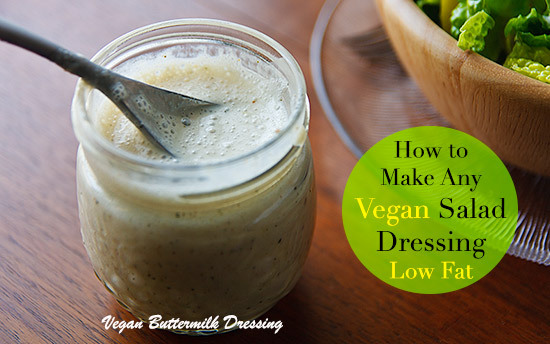 Here are a few of my tips for making fat-free but tasty vegan salad dressing. If you don’t mind a sweeter dressing, replace the oil with orange juice or other fruit juice. Replace the oil with aquafaba–the broth from a can or pot of chickpeas. Try replacing the oil with vegetable broth plus one of the thickeners below. Replace the oil with water, but double the herbs and spices and add a thickener. Add a thickener. Some people add xanthan or guar gum, which can be tricky to use, but I prefer using ground flax seeds or chia seeds, both of which form a gel when combined with liquids. 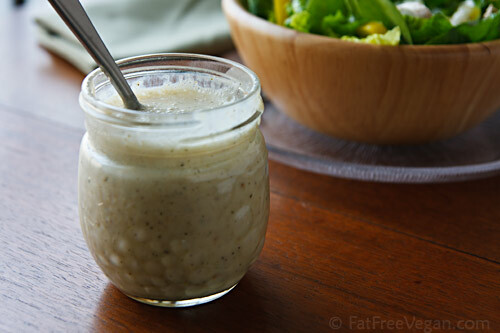 Chia seeds have the advantage of not needing to be ground first, and their lighter flavor and appearance (if you use the white chia) make them better for dressings. And both are great sources of Omega 3 fatty acids. Start with a teaspoon per cup of dressing, blend well (with a blender, if you like), and allow to stand until thickened. Add more if necessary to achieve the thickness you desire. Add dijon or coarse-ground mustard. A couple of teaspoons per cup of dressing will add zing without being overwhelming. Add a little nutritional yeast for a richer, more savory flavor. Blending in just a small amount of higher-fat ingredients such as nuts, olives, or avocado can give flavor and body to your dressing without a lot of fat–as long as you don’t overdo it. Fresh is best for herbs, but if you’re using dried, allow time for the leaves to rehydrate and the flavors to blend. Most fat-free dressings will taste better after chilling for a while. Experiment with different vinegars: balsamic, red wine, and white wine are standard, but fruit-flavored vinegars such as raspberry, fig, or blood orange can add a different dimension to your usual salad dressing. It’s surprisingly easy to make a creamy dressing low-fat. Just substitute silken tofu for mayonnaise and vegan yogurt instead of buttermilk. You can also make your own soy buttermilk by adding a tablespoon of lemon juice or white vinegar to a cup of soymilk and let stand until curdled. If you absolutely cannot stand oil-free dressing, try reducing the amount of oil a little at a time, using some of the replacements suggested here. 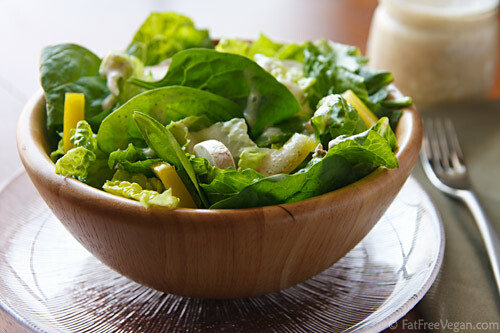 There’s evidence that some fat helps your body absorb the nutrients in salad. Rather than use oil, which has been stripped of all nutrients but fat, I recommend adding nuts, seeds, or avocado to your salad. What are your tips for making oil-free dressings? Let me know in the comments. Here’s an easy, creamy dressing that I threw together in just a few minutes. I used a salt-free seasoning, Mr. Spice House, as a short-cut to avoid having to measure many different herbs. You can use any combination of herbs you like, adding more to taste as you go. 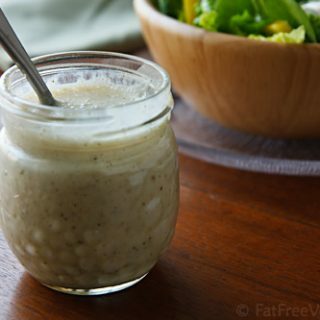 Though the percentage of calories from fat in this recipe is what I would call higher-fat (over 15%), notice that the overall number of grams of fat is low (about 1) and a serving is 3 tablespoons, instead of the 2 tablespoons that most bottled dressings call a serving–great for those of use who like a lot of dressing on our salads! This easy recipe is very versatile. My husband likes to drizzle it over steamed broccoli, while I spoon it over baked potatoes instead of margarine. Place all ingredients into a blender and blend until smooth. Add salt and additional seasonings to taste. Chill until ready to serve. Stir before serving. I try to keep this blog focused on food, but recently I got the chance to talk about myself with Nikki Jong at menuism.com. Check out the interview. Myself I am going through the’change’ and found corn, soy and almond milk causes hormone issues. Makes your body heat up and causes brain -fog. I found coconut milk, oil, cream is like Tufu it blends into anything. I found milk has 10% Formalyde per gallon. I know for fact because my cousins run a dairy farm. They drink raw milk, no processed milk ever. We do not like dairy, vinegar of any kind, GMOs’ are unknowns what the processed foods. Looking for a simple recipe for ground and oil of flaxseed. Thank you for your page and more info that helps. 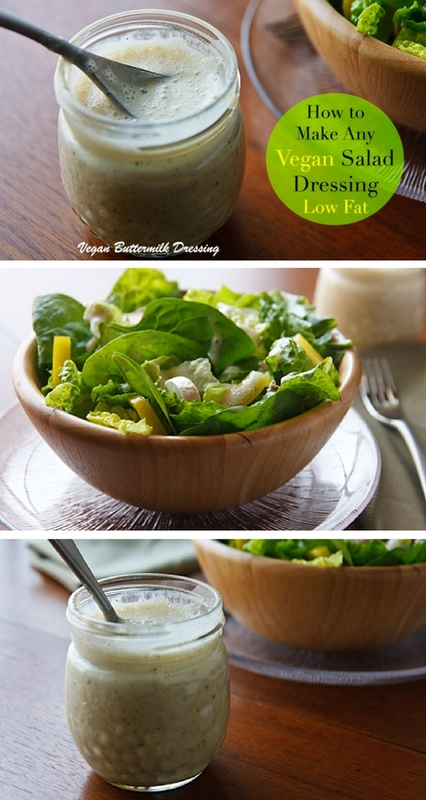 I love this buttermilk dressing! Thanks!